I recently read America, Welcome To The Poorhouse by Jane White. I wasn’t quite sure what to expect with that slightly caustic title and I’m still not quite sure what to think after having read it. From the cover jacket: “America, Welcome to the Poorhouse reveals the political and economic forces that got us into this predicament, strategies to get Congress to enact needed reform, and practical tips you won’t find anywhere else on how to make the most of your money until reform happens.” So that being said I read on looking especially for the practical tips I wouldn’t find anywhere else. I’m not going to mince words, this is a politically motivated book thinly veiled as a personal finance guide. The tiny bit of practical financial advice is something you could easily find on most any of my fellow personal finance bloggers sites, or this one for that matter. So that leaves you with roughly 90% of text filled with ideas to make the Federal Government take care of your finances for you. I sit firmly on the side of personal responsibility so it’s a bitter pill to read on and on about why the government and your employer should be doing more for you. It just paints such a negative picture of the current state of affairs I have a hard time recommending this book to anyone. I really tuned out when I hit the section titled: “Solution to the College cost Crisis: Shift Costs Away from Households onto Rich Taxpayers, the Colleges, and Their Rich Alumni.” I honestly thought this was a tongue and cheek section heading but alas no she was serious. So apparently all of our college issues can be solved by the Robin Hood stimulus package. My overall recommendation, save your money and maybe you can actually retire without the governments help. Ouch, tough review but honest! I’ve got my own review coming up, with a slightly different vantage point. .-= Financial Samurai´s last blog ..The Katana: Favorite Posts of The Week Ending 11/15 =-. There are a lot of books dealing with this topic (the unraveling of America), but I think the takeaway for all of us is in seeing what we need to do in order to improve our situation against that backdrop. Looking toward the leadership may be a vain hope, and politicizing the solutions is worse than counterproductive. I haven’t read the book, but there are plenty more like it that take the same route, as if the only solutions are collective. What about living beneath our means, saving and accumulating money, deciding that we don’t need the lastest gadget or to follow the herd into oblivion? All of those are things we can do that don’t involve politics and if enough of us do them, real change will happen even if the leadership doesn’t get on board. Nice concise review – it does seem like it sits in some wishy-washy range between being a really serious review of political economy and real personal finance advice. Don’t get me wrong – I think people can always practically benefit from knowing more about the larger picture – but it sounds like this book just isn’t organized or clear-headed enough to pull it off. .-= MoneyEnergy´s last blog ..Stock Market Correlations With Moon Cycles ““ Should You Buy Stocks On a Full Moon? =-. Great job reviewing the book! I felt like there were two books. I appreciated some of the basic financial rules of thumb. The last part of the book wasn’t my cup of tea. Honestly I felt slightly bad giving my own caustic review since they were kind enough to send me the book, but it just so doesn’t jive with my point of view I had to say something. I’m with you MoneyEnergy I definitely agree that there are a lot of people out there who seem to be bent on taking your money every way you can (Wells Fargo I’m talking about you again) but devoting a book to some political agenda with a little financial advice was painful to read. Laura you hit it on the head. It was two books but strangely cojoined. Financial Samurai I’ll be looking forward to your take. Wow, it really is such a sad day when people not only think these kinds of things but actually publish them and are proud of them. I would be disgusted with myself if I ever resorted to the lazy mindset of “Oh, those people are successful and rich so since they worked hard to have more money than me they should just give some to me for college so I don’t have to work my way through school and build something through my own sweat equity”. Whether someone says this statement about themselves, their kids, or someone else’s kids it is still a sad day for the American dream of working hard and pulling ones self up by their own bootstraps if this kind of thinking ever becomes main stream – however tempting it is to the naturally lazy and selfish side of all of us. 80% won’t be able to afford to retire, yet we’re being warned that 10% will have saved ‘too much.’ (In recent articles that have been quoted and requoted). So basically half of those who have done a good enough job saving overshoot the goals? Did the author of this book provide decent backup to the claim? Hey Paul! My review is out, and it is decidely much different from yours. Check it out! Also, out of curiousity, did the publisher offer you a free book giveaway and you turned it down b/c you did not like the book? Just wondering how things work. 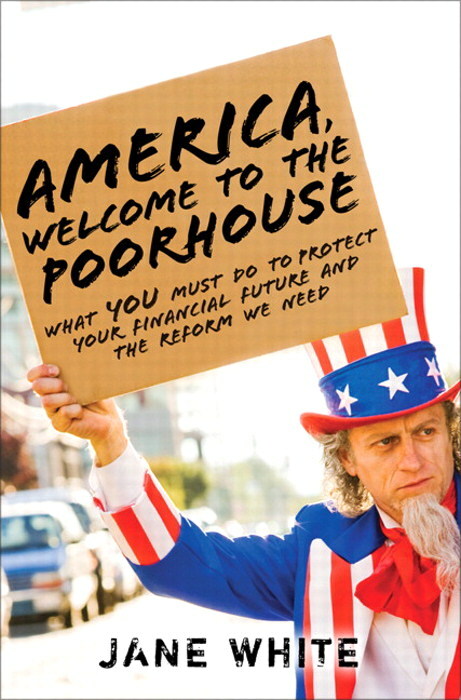 .-= Financial Samurai´s last blog ..Book Review & Giveaway: “America, Welcome To The Poorhouse” =-. Previous post: 10 Things Your Baby Doesn’t Need that Can Fund Their College Education.